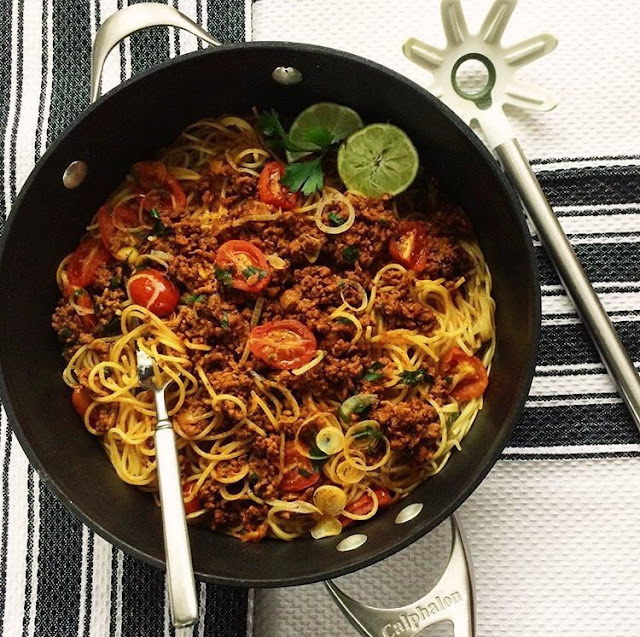 Persian-style ماکارونی macaroni (spaghetti) with ground beef, onion, garlic and tomato sauce is delicious and quick to make. This simple pasta dish is perfect for lunch or dinner any time of the year that your family will love! I usually make this dish with with the thin spaghetti noodles. However, you can use any types of pasta noodles. In a large skillet, heat 3 tablespoons of olive oil over medium-high heat, add onions and saute until translucent. Add the garlic, saute for another 2-3 minutes. Add the turmeric powder, stir. Add the meat to the skillet, break into very small pieces and brown. Stir in tomato paste, cook for 2-3 minutes, add the tomato sauce, salt, pepper, cayenne pepper, oregano and a cup of water. Stir well. Cover and simmer over low heat for about 30 minutes. Heat 2 tablespoons of oil in a heavy bottom nonstick pot, add some of the pasta, add a large scoop of the meat sauce, then add another layer of the pasta. Building it into a shape of pyramid. Cover and cook for about 30-40 minutes over low heat. This delicious recipe may be served as a refreshing light lunch or dinner or a tasty appetizer. 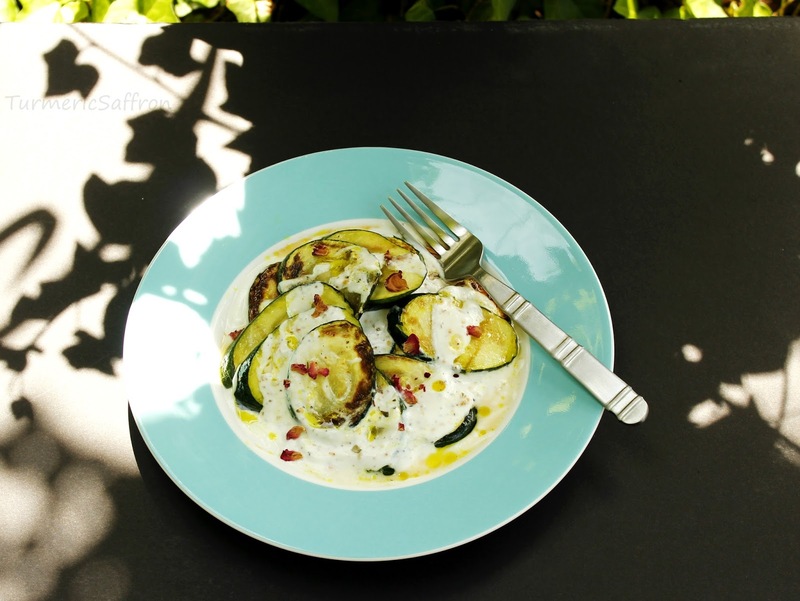 The first time I had zucchini with yogurt and garlic sauce was at a friend's house for lunch and it required very little time and effort to make! In a large frying pan, heat 3 tablespoons olive oil, add zucchini slices, fry until golden brown on both sides. Remove from heat and place on paper towel to remove the excess oil. In a bowl, combine yogurt, minced garlic, red pepper, salt and pepper, mix thoroughly. Spread 1/2 of the yogurt mixture onto the the serving platter. Place the zucchini slices on top of the yogurt and spoon the remaining yogurt mixture over the slices. This sweet and sour stew is usually made with boneless chicken. This time I made it with mini meatballs. 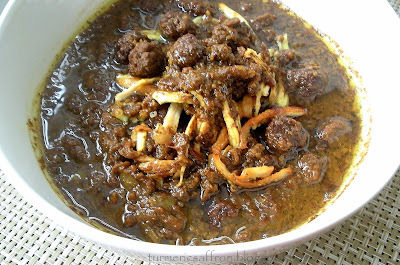 In my opinion, فسنجون با کوفته قلقلی fesenjoon/fesenjan with mini meatballs is as equally delicious as the chicken fesenjoon. It is the flavorful, slow-simmered sweet and sour pomegranate walnut sauce that makes this stew so amazingly delicious. In a heavy skillet, heat walnuts over medium heat for about a minute or two. Stirring frequently. Set aside. 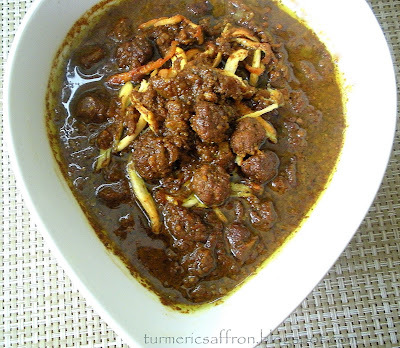 In a mixing bowl, combine the ground meat, turmeric, salt and pepper. Shape into small meatballs and set aside. In a large pot, saute onions until golden brown in 3 tablespoons of oil over medium heat. Add meatballs and fry until brown on all sides. Add the ground walnuts, cubed butternut squash and 2 cups of water. Bring to a boil, reduce heat dd pomegranate molasses, cover and simmer for 45 minutes. Stirring occasionally. Add sugar, saffron and a little more water if needed. Cover with the lid slightly ajar and cook for another 30 minutes on low heat. Taste and adjust the seasoning. If you prefer a sweet fesenjoon add more sugar to make it sweeter, if you like it more sour add more of the pomegranate sauce to the stew. However, the taste should be a wonderfully well balanced mix between sweet and sour. 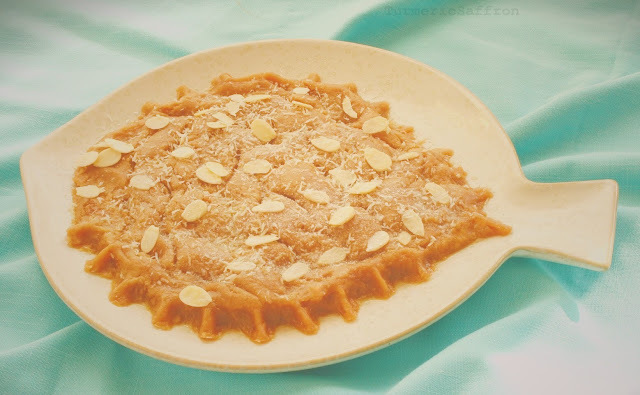 Here's the link for my other Fesenjoon recipe. 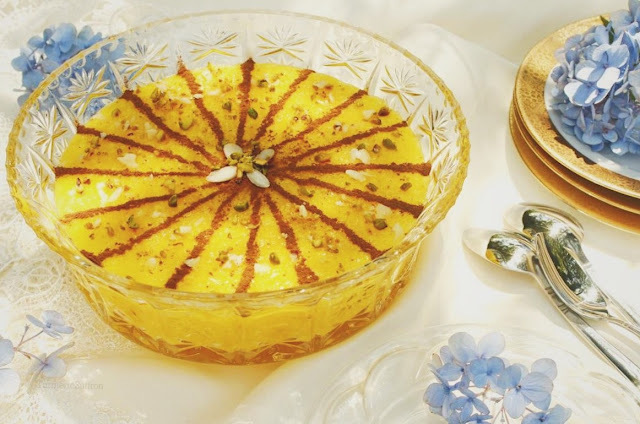 شله زرد Sholeh zard - Saffron and rosewater rice pudding is an aromatic and flavorful traditional Iranian dessert that can be made all year round and it's one of my favorite desserts. This recipe takes a little bit of time and patience to prepare but it is well worth the effort. Rinse the rice with cool water until the water becomes clear. Drain and place the rice in a large bowl, add 6 cups of water and soak the rice for 6-8 hours. Drain the washed and soaked rice, place in a large heavy-bottomed pot, add 12 cups of water, bring to a gentle boil over medium heat, reduce the heat, cover, leaving the lid a little ajar, cook over low heat for 40 minutes or until the rice is soft and the water is fully absorbed, stirring occasionally with a wooden spoon. Add the sugar and stir until it is fully dissolved. Add the slivered almonds, stir well and add the butter. Add the saffron and mix thoroughly, simmer for another 20 minutes over low heat. Add the rosewater, cover and cook for another 10-15 minutes over low heat. Pour the rice pudding into a large serving bowl or several small bowls. 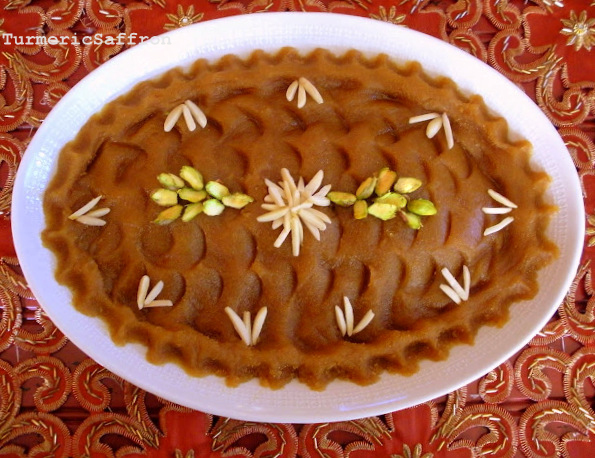 Garnish with cinnamon, almonds and pistachios and let cool for at least an hour before serving.